My Creative Corner! : Technique Page Time! 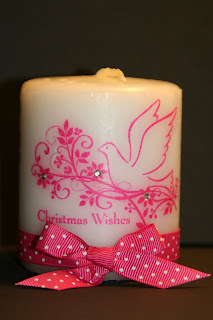 Have you ever stamped on a candle? Well, it's a very simple technique! Oh and it's even fun too! First you stamp on a piece of tissue paper. Color in your image. Cut the image out and place it on your candle. Place a piece of waxed paper on it. Pull the waxed paper tight and heat it up. The important thing to always remember when doing these is keep the embossing tool moving. If you keep it in one spot too long you will melt a dip in the candle and it won't look good. Once you think you have it all melted on, remove the waxed paper. If you see white spots of tissue paper still showing, just heat it up a little (without waxed paper) and you can see it melt and blend in. As simple as all that! The image I used here is from the Stampin' Up! "Gifts of Christmas" set. I didn't have to color mine. I just stamped it in Melon Mambo ink. I saw this on someone's blog a while back and I apologize but I don't know who to give credit to. I try to add a name and website with the images and I probably did but can't find it. So if you know who did this, please let me know and I will give them the credit they deserve on this FABULOUS candle! These are a great Stamp Camp item, Christmas gifts, Hostess Appreciation Gifts, Customer Appreciation Gifts and a fun Craft Fair item. This is #2 in the 4th set of technique pages. I still have some of set #3 available. They should be available in my web store soon. And you can always email me about them too! Wow - it does look really simple and beautiful! I am going to need to find some time to try that with my next batch of candles. It's so beautiful.You know you can also do it without "wax paper"? Another technique who needs just a little bit more patience.